In order to not be identified for botting too easy I have created this little tool. Original idea was a simple zoneChanging option for automatic zone change. In the meantime this project got a little bigger. 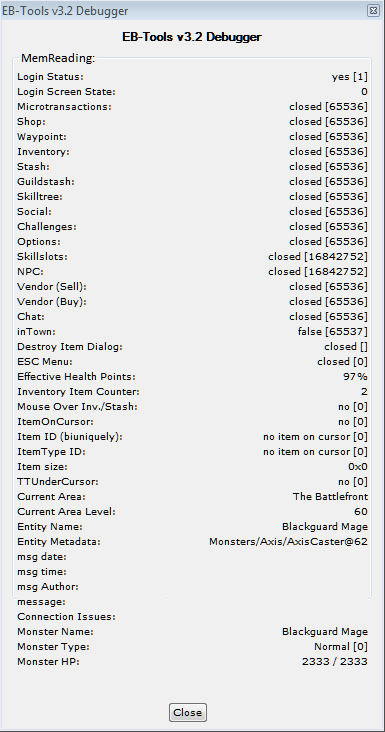 It now supports stashTab changing, many additional informations and ofcurse the zoneChanging stuff (incl. map/zone switching)! zoneselection is completly random now! you can set up the timerange which you want to spend before changing zones & stashTabs. added option to clear mem automaticly every 120sec. 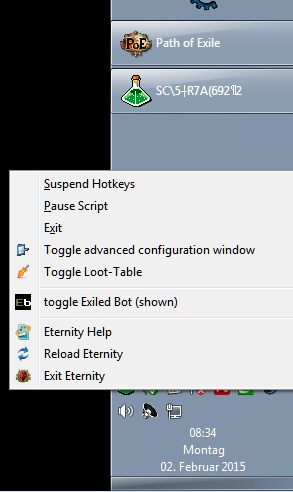 Run the extracted EB-Tools.exe and follow instructions. BE SURE TO RUN EB-Tools AS ADMINISTRATOR! If you encounter bugs let me know! If you have any feature requests which should be added, let me know! I really appreciate every feedback! If you have any questions or comments please post them in here. I wont do any support via PM! Use this Thread! If you think you can help improve this project - I am looking for contributors! So PM me if you think you can help. Thanks to bonebox for testing, you're worth a mirror! and an awesome guy! I am missing you bro! Thanks Alk for the Bot and some additional help! Thanks GuruD for his amazing work on his MultiScript! 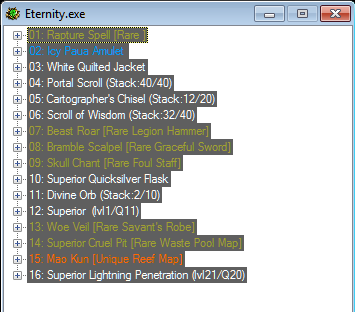 Thanks to MekongSwells for the original gui! Without you, all this would not have been possible! 12.07.2014: v3.0 - see the full Changelog here! 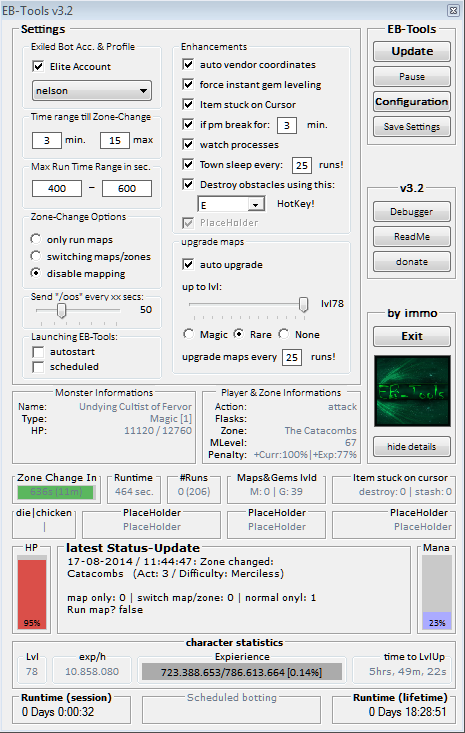 13.12.2013: v1.7 - added number of zones & stashTabs / 5 stashTabs supported / rewritten time-formating / fixed Overlay display bug! 07.11.2013: v0.9a - rewritten the whole script. does it smells like a new version of EEB in here? Man you've scared me at first run. Why you show it in milliseconds? looks great, now if I wanted zone one, I would simply change the names? Thanks! Sorry for the inconvenience, as soon as I update this script I will post the progress here! Please excuse but I don't reaiiy understand the consensus of your question. Simply choose your two desired Zones and enter them after "area1ZCini =" and "area2ZCini ="
any chance to update ZC for version v0.12? Sorry if this sounds noob-ish, I know how to open/edit the zone change.ahk, and I understand what it all means, but how do you "run zone changer.ahk" after editing it to fit your needs? obviously I understand the file has to somehow impact the bot before starting it up, but I just don't get what you mean by "run" it. Zone_changer.ahk is an autohotkey script! You need to install AutoHotKey in order to run the script. 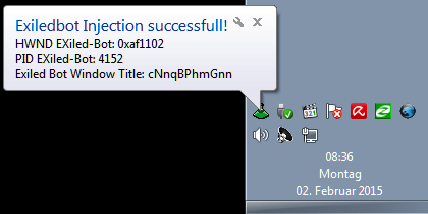 After you have installed AHK simply double click the script. Within the starting post I even asked for feedback! Since the desired update 5 days ago, there were indeed 50+ downloads of the scripts but not a single comment/feedback. 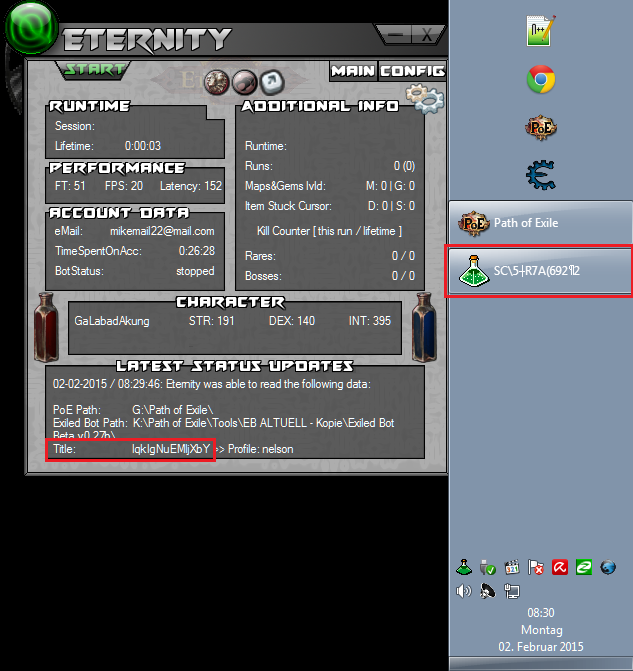 v1.0 contains the following updates:[*:11k48u80]Script now starts PoE & Exiled Bot automatically. [*:11k48u80]Added an inGame overlay Menu. Updated Script can be downloaded here! Nice work you have done there! about to give it a go ...let u know! I was about to give it a try, but looks like we'll need to wait for an update first! The script can be easily modified to be used with more than 2 zones. I run with 4 zones, 7min for each. Different difficulties, acts, locations for more security (currency drops everywhere+some uniques drop only in low-level zones). The only better stuff, that would be helpful would be "infinite ledge" script. Bot enters the Ledge and after clearing it creates new Ledge zone not via waypoint but re-entering the location. This would be very nice, indeed. This is my modification. Big thanks to immo for the main script! This is simple copy-paste modification, bot works well - at least for me. #Warn ; Enable warnings to assist with detecting common errors. StringCaseSense, On ; Match strings with case. ; Some various fancy tray icon stuff. We need to give the script list of zones we want to use - the best option would be, to be able to set more then 2 places (4-5 is good?). I don't really understand the code that well to modify it properly. What I've done? I've added two more zones to the loop just by copying the given zones. I've been observing my bot and he were running in every zone from the given zones. Another idea for the script modifications - I don't like the running bot and game features. I am using Sandboxie to run the bot (I have only one bot) - with it I can maintain two different configs for the game (Sandboxie creates another parallel register, and PoE keeps the configuration in the register AND in user settings). That way I create two different log files of PoE (which, I belive, sometimes are sent to the developers for the performance and monitoring proposes). @gamemaste789 - I think that using just if-else is not enough, if you need the bot to run each zone in the loop. Of course you can build a relatively complex if-else instruction to simulate the loop, but it will be hard to debug and work with after some time. Ok, thx - I get it now. I don't know why I didn't saw your code o.O.